As a pharmacologist I believe that in-depth studies of plants used for healing in indigenous cultures will provide the best source of finding new medicines. However, researching and establishing plant medicine efficacy and how they heal so that they may be brought into clinical practice has proven difficult. I felt that the context they were used in, the culture, belief systems and rituals were important part of the plant healing process and needed to be incorporated into the research paradigm. My strategy has been to not engage in documentary photography, but to interview healers and then observe and participate in their healing rituals. Informed with this creative experience I worked collaborative with them to make pictures that capture and convey the essence of their healing treatments and environments. The photographs of this project are made with medium and large format film cameras and the images printed large scale so that their richness of detail and color recreate the experience of being there. In addition to the fieldwork I have been doing extensive research into the anthropologic, sociologic and scientific/medical literature on indigenous and alternative modes of healing theory, research and analysis. This is combined with information from the interviews and other written observations gathered in the field and blended with the photographs in exhibitions, presentations and a book (in preparation). The indigenous healing paradigms I studied are part of a larger group of therapies known as complementary and alternative medicine that are being brought into Western clinical practice. The esoteric nature of these therapies does not lend them well to established methods of scientific scrutiny. Yet eighty percent of the world’s population receives their medical treatment through these therapies – they do work. To obtain scientific validation of these paradigms, scientific measurement and observation must expand beyond its traditional objective boundaries. Art through its conceptual nonlinear means of communication can stimulate new ways of observing and understanding in science. One of the major goals of my work is to facilitate incorporation of these paradigms into Western clinical practice. The photographs serve to create a receptive environment that allows the images, ideas and experiences to transcend us to new ways of knowing and healing – and hope. Our present medical system in crisis. Much of the knowledge, insight and plant medicines developed by indigenous cultures over centuries of use may complement and enrich western medicine with less costly and less invasive treatments that are more in tune with our natural healing mechanisms. It is a race with time as the Amazon basin, a cauldron of genetic creativity that has evolved an estimated 800,000 plant species, is disappearing to development, and the healing knowledge of shamans and traditional healing is being replaced with Western medical technology. It has been said that every time a shaman dies without passing on his knowledge it is as if a library has burned. Every time a plant becomes extinct, its unique genetic make up and possible medicines are forever lost. Two Worlds: Mercado de las Brujas (Witches Market) and modern pharmacy - La Paz. The ladies of the Chifleria Margarita had their wicth's market a half a block from my hotel. They were agreeable to a photo for quince (15) Bolivianos or about $2. Their stall is crammed full with herbs, remedies and ceremonial objects including llama fetuses, condor wings and packets of materials for creating despachos, messages or requests to pachamama (Mother Universe) for her assistance. I didn’t realize until I returned the following year that a modern pharmacy is up the steps and through the door in the center of the picture. It speaks volumes to the evolving health care in Bolivia. Several decades ago the government under pressure from western doctors and pharamacists suppressed traditional healers and medicines. Healthcare for the general population precipitously declined. Traditional and plant medicines were the only treatments available to most people and they obviously had a level of efficacy, even if rigorous scientific investigation hadn’t been applied. The government rescinded its efforts and traditional healers were allowed to practice openly. The upshot has been a deepening respect between western and traditional practitioners and a number of clinics have opened where traditional and western trained doctors work side by side, passing their patients to the healer with the most appropriate treatment and medicine for a specific illness. The potato, developed by the Incan civilizations eons ago, is one the world’s four staple crops, along with rice, wheat and corn. It is thought that the Ican worked with over 100 different wild genetic variations that have developed into 5,000 varieties worldwide. The International Potato Institute in Lima Peru has seed stock of over 4,000 varieties. In the mountains outside of Cuzco, near Pisaq Peru six communities came together to develop the Parque de las Papas or potato park dedicated to preserving genetic varieties in the field, cultivating 600 different varieties in a communal fashion. The high austere landscape is also being developed as a tourist destination to celebrate the birthplace of the potato. Annually, the six communities engage in the fiesta de las fronteras or celebration of the borders. The young unmarried men of the communities dress as egrets using the bird’s plumage and white fabric to create their avian illusion. At designated time they swoop down from a high mountain pass to the fiesta to meet the young women adorn in their finest dresses for dancing and courting. There is a bit of ceremony as they first alight in a group near the edge of the assembled crowd. Then as birds, they suddenly flush and move to another spot in single file. After several more times they form a double file that the young women pass through so each man can see each woman and vice versa. A great fiesta then follows. All drugs once came from plant or natural sources, including minerals such as gold. With the synthesis of barbituric acid, the prototype for the barbiturate sedative-hypnotics in the late nineteenth century, interest developed in the total synthesis of new drugs. Over the last forty years the greatest efforts in drug discovery have been put into the medicinal chemistry lab in what is called combinatorial chemistry. Small molecular entities with structures related to known molecules that have drug activity are reconstructed in many different configurations through computer generated models and test for activity with high throughput technology that looks for drug receptor binding, genome activation and other screening techniques. The literature claims that more than 100,000 molecules can be screened per day. What has this tremendous investment bought us? Through combinatorial chemistry only one totally de novo synthesized drug has been approved for clinical use by the FDA. In contrast, over the last twenty years, half of the new drugs introduced have come from plant and animal sources. The rest are new uses for established drugs or minor modifications of existing drugs to slightly modify or in many cases make a copycat drug. New drug discovery is at an all time low. More than 80 percent of the world’s population gets treatment and medicines from traditional sources most of which are plant medicines. The meager results in attempting to find new molecular entities from the chemical lab approach suggests that researchers are lost in the chemical forest—they can’t see the cures for the chemicals. One problem is that the process is based on existing information, present drugs and protein receptor binding knowledge. Being locked into this limiting process makes the discovery of wholly new molecular structures and classes of drugs difficult or impossible. What are the chances for serendipitous breakthroughs like Fleming’s work with penicillin in a computer-controlled environment? 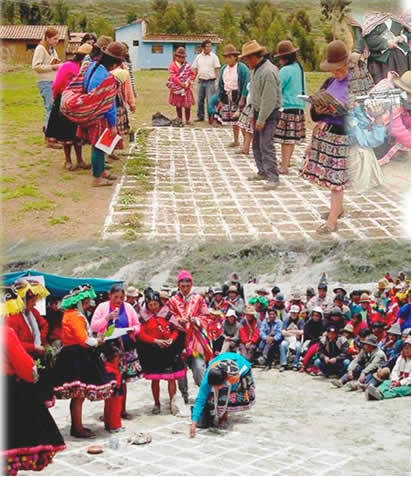 Compare the high throughput theoretical model ae with the healing plant discovery process by an Andino community near Pisaq, Peru. When an unfamiliar illness afflicts the community, residents assemble and, led by the shaman, engage the matrix or yupana to discover a treatment for the illness. On one axis of the matrix, the most common healing plants are placed at the heads of columns; on the other axis, symptoms are put in rows. Placing zero to five stones in the intersecting square indicates the effectiveness of each plant for treating a particular symptom. All the plants and symptoms are thus plotted on the matrix, the plant, or plant combinations, that together treat all the symptoms of the new disease become its treatment—a simple, yet highly practical and elegant procedure. This is not to suggest that drug research should suddenly go this way, but developing methodical investigation of existing plant and healing knowledge gathered over centuries to aid in new drug discovery seems both wise and reasonable. Possible combinations of the basic elements of organic chemistry to form new compounds are infinite. Nature, through living things, makes complex molecules that have a specific purpose in aiding in the survival of the producing entity. The range in number and complexity cannot be dreamed of in the synthetic laboratory. Furthermore, these molecules have been prescreened by the plant to have biological activity. Our common ancestry with plant and animal life increases the likelihood that the chemicals they produce will have an effect in our bodies in some fashion. Western science and biomedicine consider healing knowledge and medicinal plants as objects and commodities to be managed and bought and sold on the marketplace, independent of the original producer. In this paradigm knowledge is a matter of neutral, universal verification. By contrast, in the indigenous healing paradigm, neither plant nor healing knowledge may be separated from people and relational context. Healing power is understood to come precisely from their respective position in an overall network that includes plants as well as human beings. Knowledge is a facet of the spiritual whole of the universe. Healing plants cannot be ripped out of their environment, carried to a laboratory a continent away and deconstructed through physical and chemical degradation to find the singular molecular entity responsible for its healing while its context is left behind. Small wonder it’s difficult to find plant medicines in the science laboratory when most of its healing spirit has been left in the jungle. Carmen Sicus - Pisaq, Peru. Carmen related her process and thoughts on healing in an interview conducted high in the mountains above Pisaq, Peru. She said that many of her patients’ ailments and treatments are routine, like with any doctor. She takes time with her patients, listens to them and gives them an herbal medicine. For diagnosis Carmen asks many questions – physical, emotional and spiritual and from what she learns she prepares the medicines. But she is also presented with difficult patients and to diagnose and find the right treatment she must dream. The dreams come to her because she has been thinking and trying to heal her patient, and she believes that it is God that brings them and the cures. The vision she sees is of someone else healing the patient and she must copy exactly the process of the treatment. Sometimes she is told that the patient cannot be healed. She works through God and says that prayer, or ritual is important in association with the plant medicines. Without them they might not work and then the patient would lose faith in the treatment. She believes also there is a evil spiritual nature of illness from the ancestors, but again it is a matrter of belief; if you believe the evil spirit will make you sick, it will, if you don’t it cannot make you sick. In response to my question of ritual in the harvest and preparation of plants she said that the morning was the best time to harvest. At night the plant sleeps and is not useful. The optimal time is just after the sun has dried the dew from the leaves and killed bacteria and bugs. As the sun rises the healing ability of the plant declines, they wilt and lose their power. I mentioned how western medicine thinks of plants as sources of basic chemical drugs and asked her how important she felt these chemicals might be in plant healing. She said she can’t think of plants in scientific or chemical terms, that it’s a matter of belief and purity. And for plants to be most effective one has to also eat a prescribed plant diet that helps the plant medicine work. Still these treatments take weeks, even months for complete healing to happen. And this is part of the problem in western medicine, you expect the treatments to heal with in a day or two. It took a long time for your body to become vulnerable and sick, it likewise takes time to heal the body completely, not just hide the disease by temporarily treating the symptoms. You want the pill, the doctor, the treatment to heal you, you don’t want to be involved in healing yourself. The problem in western societies is that you eat to many chemicals – they’re in your food, water, packaging, environment everywhere – a chemical diet. They cause plant medicines to lose their effectiveness and make you dependent on chemical medicines, pharmaceuticals. This is why it is difficult to show the healing effectiveness of plants in your society. Originally the body was never made for chemical medicines, you have pushed it into that unhealthy direction with your diet. Plant medicines are effective and always better than chemicals but you must give up the chemicals and return to natural eating. Everything you need is already in your food, do not take them out and replace them with chemical nutrients, it just contributes to your chemical addiction. Purity is important, she said again, maybe the chemical part of the plant would work in chemical eating people but without purity, the spiritual will not. These symbolic objects carried in small pouches by ytiri healers of the Andean highlands are arranged into mesas for spiritual communion. Mesas are ceremonial fabrics on which the objects are arranged, generally in a left-to-right manner, that represent the journey from sickness to health. They are used to prevent sickness and imbalance in the community as well as an individual. The llama is a sacred animal and the fetuses are commonly used in the preparation of mesas and other ritual offerings. Throughout the Andes they are buried under the floor of a new home or building to ward off evil spirits that may already be in the house, or come later, and to bring good fortune to the household. So common is this practice that it is thought that upwards of 95 percent of the buildings and dwellings in the Bolivian Andes have a llama fetus under them. I photographed the mounted red eye calf in the headquarters of the Chimane’ community of Trinidad where it hung with other cultural artifacts. I was meeting with the Chimane’ gran cosuelo seeking permission to travel to one of their communities while the calf head eyed me from across the room. Fascinated I later photographed it. I didn’t think it to be a decorative object but I also didn’t ask if it had some symbolic significance. I later noticed them in a number of homes in the Bolivian lowlands, all with red eyes mounted into the head. I didn’t draw a parallel with the llama fetus until I noticed in the photographs in my studio that the llama fetuses often had a red eye embedded in them. Since there are no llamas in the lowlands I surmised that possibly the red-eyed calves serve in place of the llama fetus to protect homes and bring good fortune. While it looks tough for the frog its not really as bad as it appears. Sapo is Spanish for toad but this is really a tree frog, the phyllomedusa bicolor, which is used in the Matzes hunting ceremony in el Loreto, Peru. Sapo refers more specifically to the animal’s psychoactive sweat and the ceremony. The Matzes capture the frogs by mimicking their mating call, “dow kiet”. They then stress the frogs by stretching them out between four sticks to get them to exude their very bioactive defensive sweat. Considering its effects in man described below, its assumed to be aversive to predators who quickly learn to leave the animals peacefully be in their trees. The sweat is mostly produced behind the ear where it is scraped off and stored on a flat stick. For the ceremony, the skin of the hunter is burned with a hot coal, 2 to 8 spots about a centimeter across and allowed to scab over. The scab is then removed and the sweat which has been is made liquid with a little spit is pressed into the wound where it is directly absorbed into the blood stream. The more spots the greater the effect. It immediately stimulates smooth muscle, increasing blood pressure, racing the heart and often causing vomiting and diarrhea. The hunter falls into a trance during which visions appear showing him where the animals will be. It last about a half hour. The more interesting part is that for up to 72 hours following the experience the hunter has increased stamina and courage, and perhaps most important, a greatly increased visual acuity helping them to discern their prey in the dense jungle foliage at a great distances. The sweat has been shown to be a mixture of dozens of polypeptides, a large number of which exhibit bioactivity in man and many have been defined molecularly and categorized by effect. Research is on now to look for healing and diagnostic properties. Upon returning home, I thought this might make an interesting picture – to photograph a scene reflected on a disk of stilled water contrasting with the textured waves outside the hoop. However, no matter how I tried, my hoop never stilled thewaves - it’s bouncing caused by the outside waves created waves on the inside about the same size. I didn’t remember if the shaman’s hoop had actually stilled the waves. But thinking about it I wondered - had he told us what our Western minds needed to believe, that the hoop merely reflected the sky? What, finally, did he see in that water? Would our western minds simply not accept that maybe he had consulted with spirits he contacted through his reed window to another world? The patient comes to the doctor with a desire that he bring order into the chaos of his illness. The shaman evokes symbols or metaphors that provide a language for the patient to express, understand and transform the personal or interpersonal conflicts underlying their illness. (Claude Levi-Strauss). The symbols and metaphors are based on the cosmology of the culture in which the shaman practices. These provide a shared understanding of the etiology of illness, prevention, curative practices as well as define the roles for shamanic healers in their ability to treat illness and restore health to the individual and community as a whole. He becomes a master of using his community’s cultural imagery, symbols and metaphors to enhance their belief and faith in his knowledge and expertise. We can easily substitute doctor for shaman as our doctor evokes scientific explanations for the causes of our illness and the superiority his technology over the illness in order to reinforce our belief in both the science of medicine, and his power to utilize it and heal us. I had interviewed Roberto on my first journey into the hinterlands of the Gran Chaco savanna areas of southern Bolivia. I had hitched a ride with World Wildlife Society game wardens to the village of La Brecha, a 12-hour bone-jarring ride over the worse roads, and I use the term road generously, I’ve ever been on. La Brecha is one of the many villages of the Izozo Guarani indigenous community that stretches south from central Bolivia into Paraguay. The Gran Consuelo in Santa Cruz had arranged for my visit and radio phoned ahead to a Senor Nelson, the community coordinator to expect me and guide me to several healers. Roberto would be the third and last of the healers I would investigate in La Brecha. He worked with plant medicines and used tobacco for diagnosis and healing. 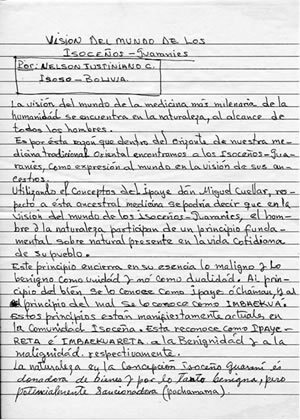 After the interview Senor Nelson said that he would write out the healing philosophy of the Guarani for me while I made interpretive photographs with Roberto. We worked in a number of locations, in his house, in the doorway and did a number of them very close up, his head sometimes filling most of the frame as he exhaled smoke. I chose this frame to work with and when I looked closely at the photograph I saw something that can only happen in photography: Roberto is exhaling smoke directly onto the healing treatise an out-of-focus Sr. Nelson is writing in the background, breathing into it a community spirit and validation. The Kallawaya medicine men of the Bolivian and Peruvian Andes, ancient physicians to the Incan kings, may be the best-known indigenous healers of South American. Traveling by foot on the high Andean trails they carry their traditional practice and plant medicines to Chile and Argentina in the south to as far north a Panama. They were brought into Panama during the construction of the canal where their mixture of plant quinines and coca leaves were invaluable in fighting malaria. They have knowledge of 1000 healing plants some say, not only from the Andean highlands but also the jungles. Cusco Peru was the center for plant and other trading between the highland and lowland peoples. The Kallawaya were and still are avid traders and seekers of herbal medicines. Over 300 of their plant medicines have been shown to have the claimed healing properties and another third are under study. Miguel Jejerina is shown here at a sunrise ceremony he conducted on a mountaintop outside of Curva near the high Cordillera Apolobamba in northeastern Bolivia, the traditional home of the Kallawaya. Located on the most prominent point in this beautiful mountain village is one the two clinics in Bolivia where Western trained and Kallawaya healers work side by side. 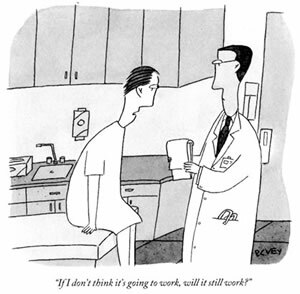 With a glance at this New Yorker cartoon, we immediately know where we are and to what the patient is referring. Such is the ritual and healing environment of the western biomedical paradigm, the setting clothing, and relative postures are immediately recognizable and unvarying. The cartoon is telling us that something very important is happening in Western medicine: we are beginning to understand what other healing cultures have known for a long time – the patient must participate in the healing process by, minimally, believing in the doctor and his treatment. Healing rituals are based on a culture’s cosmology of illness, healing and wellness. Our belief is constructed on the scientific medical paradigm and the allopathic method of treating the symptoms and destroying or otherwise removing the offending pathogens – chemicals and cutting (drugs and surgery). But removal of the pathogen does not alone heal the body, an absence of symptoms is not wellness, the damaged body must return itself to wholeness and balance – this the mind body system does and this is where belief is crucial. Rituals are the “Smoke and Mirrors” of healing and are critically important to any healing paradigm. They are performative. In this respect the healer, the shaman, the doctor is an actor working to build belief, using feedback from the patient to continually adjust his ritual/performance to the patient’s needs. The ritual is transformative; it brings the patient out of his aloneness and into a supportive community. Rituals are restorative through its immediate calming effects by the reduction of anxiety and removal of the dysphoria of uncertainty – “I know what the problem is and I can heal you.” Besides the instillation of faith the shaman evokes symbols or metaphors that provide a language through which the patient can express, understand and transform the personal and interpersonal conflicts underlying their illness. Healing through ritual is magic, there’s not a direct connection between the actions of the ritual and the healing that may result. The science community does not like magic; it wants to see cause and effect, know the mechanisms of action, a reductive materialism. It desires universal truths, a set of rules applicable anywhere whereby certain actions always lead to specific results through defined physiological pathways. But much of the work of science throughout its history has been to show that what was yesterday’s “magic” is today’s science. And by extension today’s “magic” with the application of rigorous scientific inquiry will be tomorrow’s science. Western medicine is at a loss to explain the placebo effect that the literature suggests to be responsible for 70% of healing in this paradigm. It’s time to not only accept that but to vigorously research it but with an expanded science to deal with the more esoteric healing concepts. Placebo and ritual in healing has led to a new area of investigation - psychoneuroimmunology: how semiotics are converted to physiological processes. It’s not so important that we know it’s exact mechanism of action but that we can develop a set of procedures/rituals partially based on placebo expectations and adjusted to each patient’s needs that can help initiate a cascade of healing actions that work in consort with the treatments and medicines. It’s time to apply scientific rigor to the healing rituals of all cultures to find the underlying commonalities of them all. There is a need for collaborative investigation between distinct groups and practices to increase appropriation of the therapeutic benefits of ritual for the healing of patients of all cultural backgrounds. Research and analysis have shown that therapeutic patterns that greatly heighten placebo effects are especially prominent in alternative/unconventional healing procedures. Does ritual augment the placebo effect? What makes therapy legitimate, positive clinical outcomes or culturally acceptable methods of attainment? Who decides? The man pictured identified himself only as the professor. During an interview he said that he healed when possessed by a Brazilian doctor that died in 1865. I visited him later that night when he was in a trance, speaking in a different voice and providing healing treatments. His eyes remained tightly closed throughout the session. Some research revealed that this paradigm of healing may be related to the healing of Kagwahiv shamans of western Brazil. While much of the ceremonies and healing rituals of these communities have fallen into abeyance, those who had worked with the shamans before they died said that the they healed by spirits that spoke through them. They would wear a red band across their chest and red cloth over the head during the channeling and healing. The professor conducting his healing session with a red band on his forehead appears to be a closely related variation Kagwahiv shamanism. This loss of healing knowledge, shamans dying without passing on their healing wisdom, is a true tragedy and major loss to the world community. As Mark Plotkin, author of The Shaman’s Apprentice put it, “every time a shaman dies without passing on his knowledge it is as if a library has burned.” It is not only the plant and genetic diversity of this life cauldron that is at risk with the gradual loss of the great Amazon basin, it is also the knowledge of the plants and their application to healing that is likewise disappearing. Without applied effort to stop this loss along with vigorous field research, the research on these healing paradigms and plants may soon be relegated to the dusty archives of libraries. The compendium of indigenous healing and shamanic knowledge is traditionally passed on through lengthy apprenticeships accompanied by rigorous diet (la dieta) and self-discipline. New knowledge of diagnosis, treatments, and medicinal plants comes through spiritual encounters, either through dreams, or the visionary states induced by powerful psychoactive plants, the master or teacher plants. Of the psychoactive plants potions of the Amazon basin, the ayahuasca admixture has received the most attention, not only for its powerful visionary and physiological (purgative) actions, but also for the complementary pharmacological action of the two plants—the chakruna shrub and the ayahuasca vine—that make up the brew. The leaves of the chakruna plant (psychotria viridis) contain the powerful hallucinogen N, N dimethyltryptamine (DMT), but it is totally inactive when taken orally. The gut is loaded with the enzyme monoamine oxidase (MAO), which protects us from exogenous monoamines in our food that may disrupt our adrenergic nervous system. The second plant, ayahuasca (banisteriopsis caapi) for which the brew is named, contains beta carbolines, harmine and harmaline, which are specific MAO inhibitors. When mixed together, these chemicals turn off the MAO, allowing the DMT to be absorbed and work its visionary magic on the central nervous system. The mystery, of course, is how these two different plants—out of 800,000 or more species of the Amazon basin—were first brought together, boiled for eight hours, drank (it tastes terrible), and subsequently spread throughout the Amazon basin. Shamans who use the brew claim that it is through the spirits of the ceremony that they learn the nature of new illnesses, the plants that can be used to treat them, and where to find them. Western interest in entheogens (compounds and plants that release teh God within) and hallucinogens has drawn a pilgrimage of Westerners to places like Iquitos, Peru, to partake in ayahuasca ceremonies. The ceremony’s intensity—complete with challenging visions, side effects like vomiting and diarrhea, and elaborate diet and preparation—does not make for a pleasurable experience but rather what often is an arduous journey of intention, revelation and understanding. For most seekers, however, it is seen as just one part of an all-encompassing holistic healing philosophy. It is the intention rather than the ayahuasca itself that produces the ceremony’s benefits for each participant. Speaking from personal experience from both ayahuasca ceremonies and smoking pure DMT the intense visions that begin the experience are vivid kaleidoscopes of color and seething fractal based imagery that evolves into writing ayahuasca rivers and brilliant other worlds. At the peak experience the intensity is overwhelming and then relaxes into a serene world of introspection often guided but spiritual entities. It appears pharmacologically that the intense visions are caused by the actions of the DMT, which give way to the longer acting beta carbolines that with the icaros (see healing icaros below) bring the spirits who guide the seeker to healing and self-understanding. The shamans are in agreement that it is the ayahuasca that provides this facet of the experience and experienced shamans will use it alone in their personal ceremonies and guides to healing patients. The ayahuasca is not always given to patients but often the shamans will use it as an aid to diagnosing and treatment of particularly difficult healing challenges. Full appreciation for what ayahuasca can offer the seeker cannot happen in a single ceremony and rarely in several sessions. For this understanding, an apprenticeship of months or better years of dieting, isolation and drinking ayahuasca with the shaman right for the seeker is necessary. While I have drunk ayahuasca about 25 times I don’t consider myself one personally knowledgeable in its long term effects and benefits. I have spent almost 10 months traveling in Peru and Bolivia and most of it was in seeking out healers of all stripes for this project. That experience alone was mystical and enlightening. The experience of reading science literature on line and in the biomedical libraries was mystical and enlightening. Putting together the exhibition under a deadline was not only mystical and enlightening but also often maddening with a feeling of desperation that I also experienced in my journeys to understanding. I know I am more knowledgeable in the ways of healing but it’s a sum total of everything encountered on this beautiful voyage. But I can’t deny the ayahuasca might have catalyzed many of the synchronicities and Ah Ha! moments I experienced over the five years I’ve been on this journey. The room is dark; my eyes are closed in nervous anticipation. The condor feather Carlos whips through the air fills the room with a primordial fluttering sound that transports me the Andes. Still there are no effects of the ayahuasca we had drunk in divided doses over the last hour. I am in Cochabamba, Bolivia having my first ayahuasca ceremony with Carlos Prado, a Ytiri healer I had known for over a year. Joining me are Anika and Maria Stoiana, two Swedish students who are apprenticing with Carlos as part of their training in natural medicines. Together we’re on our maiden voyages. My eyes ease open and see a faint glow near the ceiling and then realize it is the left over energy in the fluorescent fixture. I settle back against the wall and let my eyes sag shut again. Am I immune to its effects? Perhaps this is a weak brew. Did Carlos say there was only one plant in the brew? Doesn’t it require at least two plants? As my mind wanders and wonders on what could be coming, a firefly flits across my field of vision, then another. Slowly the swarm grows now moving without blinking. They synchronize into an undulating sine wave, the anaconda, their white lights now becoming vividly brilliant colors exploding across my field of vision. They become multifarious, evolving into churning fractal imagery. Moving faster, the intensity of the colors, motions and body stone start to overwhelm. A paralysis overcomes my body; I am now at the mercy of the brew. I don’t know if I will subject myself to this intensity again as I seem to be clinging to my so-called reality by my finger tips, dangling over a maelstrom of swirling light. The fractals now organized themselves into a brilliant façade of a shimmering fortress city of minarets and watchtowers with eyes at every portal. Ayahuasca rivers flow in the streets. The sky is an infinite black and from somewhere the soulful call of an unseen bird punctuates the heretofore-silent scene passing before my closed eyes. Animal and spiritual entities appear and watch, then dissolve into nothingness, they do not engage me this time but remain disinterested, only appearing to make their presence known. How can plants possess such power? It goes beyond mere chemistry of the powerful hallucinogen N,N- Dimethyl Tryptamine and the helper chemical beta carbolines to something more spiritual in the plant. Aha! Is this the secret to the healing power of medicinal plant, an essence beyond its healing molecules? Carlos continues to guide the ceremony with haunting melodies and chants; the shaking of chakapa leaves and swishing of condor feathers. He rubs our legs to ward off cramps and covers us with additional blankets. We feel cared for. compromised, it is impossible to walk without Carlos’ assistance. In the darkness of the bathroom the fading visions continue on the door in front of me mixed with the distant sounds of the city. Relieving the cramping and pressure in my bowls has its own rewards. With difficulty I make my way back to the room that now is stirring with activity and conversation. The visions are gone, replaced with a feeling of warmth and camaraderie. My appreciation of the power of plant medicines has been profoundly expanded. The morning after a particularly powerful ayahuasca ceremony , interestingly, one in which I did not drink the brew I went to photograph Maria Arevalo, Guillermo’s mother, an acknowledged powerful shamana. She was sitting at the entrance to here hut beading and was amenable to my making a portrait of her. I set up my 4 x 5 camera and framed and focused the image. After talking to her a minute I went back to the camera and noticed the image was foggy. Looked around to the front of the camera to see that the lens was fogged from the jungle humidity and wiped it of. Returning to the ground glass the image was still fogged. Looking around to the front, the lens was clear so I removed the lens to find it was fogged on the inside. Unusual I thought and cleaned it off. I returned to the ground glass and again the image was fogged. The lens in the front was clear so I assumed the loupe (magnifying lens) I use for focusing was fogged and went ahead and took several portraits. When I dismantled the camera I found to my dismay that the inside lens was again coated with condensation. Well, it’s done, we’ll see what I get. Upon my return to Iquitos I announced to several other shamans I was acquainted with that I had taken portraits of Maria. “Oh you think so?” one of them said. “You can’t take a picture of her, she won’t let you.” The print from the negative flares red as a radiating energy. Did she let me take her picture but take control of the camera to insure that her portrait revealed her powerful energy? Icaros are healing songs that are integral to the power of the shaman and an essential part of ayahuasca healing ceremonies. The term comes from the Quechua verb “ikaray” meaning “ to blow smoke in order to heal” referring to the smoke of tobacco, the most powerful of master plants in Amerindian cosmology. The shaman receives icaros from his teaching spirits during the ayahausca ceremonies of his apprenticeship. The high-pitched, often falsetto incantations are sung during ceremonies to call in the spirits and enhance the visions with spiritual understanding and healing. The repertoire of songs serves to reinforce the relationship of shaman and patient, bringing him from his isolation and into the cosmology of spirits and community of his people. The effect of hearing these melodious ethereal songs feels to one of awakening an ancient knowledge, the sound seemingly resonating with one’s very DNA releasing imagery, experience and understanding from a primordial past. At one session of ceremonies with Guillermo Arevalo I had participated in ceremony on four consecutive nights. The first three nights I had drunk ayahuasca and Ricardo, his apprentice, came to sing his icaros in front of me – I thought them the most alien of sounds. The fourth night I did not drink but this night his icaros resonated deep inside me and lifted my soul with feelings of shared memories and experiences of a continuum of past lives and a brotherhood with Ricardo. In my numerous ceremonies with ayahuasca I had come to believe that the mystical brew sensitizes one to synchronicity of subsequent experiences. Perhaps it too works through a person’s DNA, sensitizing it such that the spiritual harmonics of the icaros resonates into awareness the past events that have been encoded int it over the eons. The next day I went to his house to share my experience and photograph him. The weavings of the Shipibo Canibo communities of central Peru are also called song cloths with the melody, rhythm, words and incantations woven into them. Visually they are inspired by the brilliant constantly moving fractal geometric patterns experienced during intense ayahuasca visions. The flowing quality of these visions has been described as ayahuasca rivers. The song clothes are often used to cover the patient on a one on one healing ceremony with the shaman. Ayahuasca is presented in western and alternative therapy literature as a positive healing force in the universe. However, like all powerful forces, it can be used for both good and evil purposes. The spiritual helpers that are called upon by a shaman can be both benevolent and malevolent. A good number of shamans practice black ayahuasca or brujeria the sorcery side of the brew, as witch doctoring can be a more lucrative practice. The shaman, or more appropriately brujo, is called upon by a client to exert his desire over someone else. Often it is for matters of heart to induce someone to fall in love with the client, or return a lost love. More vengeful issues of jealousy, competition and revenge can bring in much money in exchange for delivering magic darts into the victim of the rite. The darts create a point of entry for an evil spirit that can inflict physical pain, spiritual and emotional distress, debilitating spells, illness, bad luck and even death. Shamans often treat illnesses as though they are a result of another shaman’s brujeria than a natural disease process. Don Juan Tangoa began accumulating much power when he was an apprentice. By moving from one teacher to another in gathering that power he offended and made jealous powerful shamans who then sought to kill him through their brujeria. To protect himself from their darts he became a master of the black art. They were not able to kill him and but they did vengefully cause the death of his wife who is pictured with him in the wedding portrait he is holding. He himself is very careful with his brujeria to never over react or be vengeful in his responses to brujeria directed toward him or his patients and family to avoid a growing cycle of attacks. He conducted his ayahuasca ceremonies on Tuesday and Saturday nights as that was when the other shamans of his cult all held their ceremonies. During these sessions they would communicate telepathically as in a conference call to discuss various instances of brujeria the spirits reveal to them and how to deal with it. So what is the relevance of the ayahuasca shamanic ceremonies offered in Iquitos and throughout Peru? Are they of value? Ayahuasca with its DMT and other alkaloids will do its thing but the authentic shamanic guidance is critical to receiving it’s healing. Sometimes I had a reverse racism about this, that only indigenous people could understand and exercise the full power of shamanism. The flocking of gringos and westerners to learn of the medicine concerned me, could we indeed receive the gift and pass it on? Undeniably there is a significant amount of money energized by ayahuasca flowing through the Peruvian economy. Does this corrupt those who offer it? On my last trip to Peru I my concern to Alan Shoemaker, a gringo who has been part of the Iquitos shamanic/ayahuasca environment for over 15 years. In addition to organizing the shaman and plant medicine conferences, he apprenticed for years to become a trained shaman. I laid out my concerns and he said you know I agree with your observations, there are people who take advantage of the system and there are some westerners who come to partake that do not have the purist of intentions. Some of us have gathered together to develop a system to define and accredit legitimate shamanism. But let’s also look at what is going on. First, ayahuasca unlike other drugs and even some entheogens like LSD is never going to become a recreational drug, there are no panhandlers and petty thieves on the streets of Iquitos hustling for their next fix of ayahuasca. The physical and psychological demands of ayahuasca and the discipline of la dieta are not for the accidental tourist. While some may come for a psychedelic kick, a very large percentage of the people who come to experience this medicine bring with them an enlightened philosophy of healing and living. They understand the spiritual nature of our lives, the intertwining of the secular and spiritual and that the jungle is a repository of ancient knowledge and spirituality manifested in its healing plants. The ayahuasca is only a part of their overarching philosophy. Thirty years ago, when the influx of western seekers began, the healing and shamanic ways of the old shamans were considered by the younger generations to be the archaic activities of foolish and superstitious old men. The young people didn’t believe in them anymore and turned to all things western – clothes, music, relationships and medicine. The old healers were shunned and laughed at. Worse, without apprentices they were dying without ever passing on their knowledge to a younger generation. It was being forever lost. Now come these western seekers who are turning away from world that Cartesian duality of science and secularism has created, they had found it incomplete, missing spirituality. They’re coming to visit these old men and sit at their feet to hear their secrets. They are giving them respect and elevating their stature. More important they are giving them their money, not for the ayahuasca itself that anybody can mix up, but for the knowledge and guidance into this mystical realm of healing and spiritual well-being. All this gets the young people’s attention. Like any plant medicine the ayahuasca cannot be separated from its context and the worldview of which it is part. Any young person that wanted to become part of this business would have to undertake the full apprenticeship of diet, seclusion, drinking ayahuasca and the gathering of healing knowledge and spirituality from his mentor shaman until the spirits make themselves accessible and allow entrance into their world. The plant knowledge and spirituality must be mastered as well as the healing spirituality of the jungle. What ayahuasca tourism, if it must be called that, has stimulated is a resurgence of interest by younger generation in the healing knowledge of the old shamans. In addition to the plant medicines and oral traditions of their use being preserved there is also a new respect for the jungle as a vast cauldron of genetic diversity that gave rise to its healing plants and knowledge. And with it a growing realization that it is irreplaceable, that if the knowledge and diversity which the jungle holds if destroyed it will be lost forever, never to come this way again. While its many resources can be harvested for temporary economic again, it’s greatest value is as a living breathing entity that constantly generates new life. Tapping into this continuum leads to a sustainable economy and growing knowledge. So while the motivations of those who learn and maintain the traditional ways of healing and knowledge may be suspect, the undeniable good news is that this ancient work is being preserved, as is interest in maintaining the jungle as a sustainable and renewable resource of medicines and knowledge. There were times during my journeys in South America when I felt hopelessly lost, my work seemingly going nowhere. Back in the studio I pored over my proof prints trying to find meaning and direction in the imagery that would reveal the essence of the healing experiences I had photographed on my journeys. Yet the project would not gel. Then, one February morning, I woke up to the sight of snow falling softly outside. I felt a stirring inside as the images from the project materialized on the ceiling over my bed as a slide show. A shudder ran through me as my best photos sequenced themselves in chronological order, each successive image building upon the previous one to reveal the story I had so longed to tell. My excitement rose until, suddenly, the scene of the jaguar flashed in my mind’s eye. I had seen the negative but dismissed it as irrelevant. Now I realized it was pivotal. Where was it? I leapt out of bed and rushed to my files. Quickly finding it, I put it into the scanner and hit Photoshop auto levels. The image of the jaguar literally jumped off the screen and through me. I realized in a heartbeat the significance of what had happened that fateful moment at the butterfly farm. The spirit of that most mystical animal—the ally of Amazonian shamans—had entered me and had been waiting patiently for me to reach just the right moment to show me the beauty and relevance of my work. Intuitively, I understood that, in the world of the shamans and their cultures, there is no separation between the spiritual and secular, and that viewpoint is integral to their healing work. Suddenly, I could feel the continuum of our existence, from before birth to beyond death, from infinity to infinity. All human beings have primordial knowledge of this continuum, but most of us don’t have the tools to access it—this is the territory of the shamans. The plant medicines are a key part of it, and they cannot be separated from it. Perhaps the most striking discovery of my journey was to feel within my soul the concept of these cultures that there is no separation of the spiritual from the secular. The spiritual is infused into they’re lives – in themselves and their daily existence, their family and relationships, their community and environment, their medicine and healing. It is a continuum with no beginning and no end. At some time on that continuum we appear in our bodies, live a unique life and then leave those bodies. Just before I left La Paz after four months of travel I visited the cemetery where I experienced the continuum. Compare these cemetery pictures with the one I took of my first view of La Paz at the beginning of my journey - distant and impersonal. In the left cemetery image the metaphoric coffin passes along that line and into compartments of the dead, which as we compare them to the apartments of the living in the right, are no different in size. And who are these mysterious brightly colored figures whose faces we cannot see, watching passing parade as if gatekeepers to insure this continuity of our being? Shamanism is worldwide. Generally male, they intercede and communicate with the spirits of their cosmology in behalf of both individuals and the community. They make contact and relay the spirits’ guidance on healing as well as other issues through ecstatic states and ritual. One of the strategies of shamans as a means of cultural survival has been to integrate foreign elements into their paradigm without denying their own beliefs. This was especially true in South America where to conquistadores and their missionary’s pressured cultures to convert to Christianity and a commodity system. The Shrine of Charagua photograph suggests this integration. Rather than converting, the codes and symbolic elements of Christianity were incorporated into their own shamanic structure, and the evangelistic efforts transformed into forces and representations that strengthened their shamanic and magical power. Likewise, rather than negating western biomedicine or opposing its use, the shamans incorporates western pharmaceuticals and other biomedicine techniques into his traditional healing. By utilizing the best treatments from both paradigms, he greatly enhances his healing power . Western medicine can likewise enhance its healing power by incorporating the healing knowledge that has developed not only in the Amazon basin and the Andean mountains, but from throughout the world. With proper study and evaluation they can greatly enrich and complement Western medicine. The limiting factor is the hubris of western medicine, refusing to accept the possibility that these unusual healing paradigms can actually effect healing. Respect of other healing paradigms is necessary for any meaningful collaborative research to happen. I found the limpia de flores or flower bath healing treatment throughout my travels, in the Amazon lowlands and Andean highlands. And I also found it in Minnehaha Creek in Minneapolis. Many of the ritual healing treatments of traditional and indigenous cultures are finding their way into complementary and alternative medicine practiced in the United States. And western medicine is found in many of the metizo communities in South America in such community clinics as pictured in Puesto de Salud of Puerto Nuevo, Peru. As the Kallawaya and Western doctors practicing together in Bolivia, Western medicine is looking into finding ways of working complementary and alternative medicine into its healing paradigm. Westerners are pilgrimaging to the Amazonian jungle and Andean mountains to not only experience its medicines but also learn its knowledge and ways of knowing. Some become healers in those countries, others to bring the medicine and knowledge here. Most medical schools in the United States offer a number of classes in complementary and alternative healing to at least make medical and nursing students aware of the various healing paradigms and beliefs they will encounter in some of their patients . They are encouraged to not only respoect those beliefs but to try to work within those systems in their efforts to deliver the best health care. Slowly, some of these treatments are being considered by doctors in their treatment protocol for patients. Emphasis varies. Some institutions have separate departments such as the Center for Spirituality and Healing at the University of Minnesota and the Department of Integrative Medicine at the Mayo Clinic. There remains resistance, as western medicine’s need for scientific verification of for the drugs and treatments they provide. The difficulty is indesigning clinical trials to evaluate CAM within the Holy Grail of medical research – double blind controlled random clinical trails or CRTs. The myriad of variables that must be controlled for and the difficulty of double blinding as well as finding quantifiable results to which statistical analysis can be applied presents challenging research. There are two interesting and conflicting problems here: Much of western medicine has not been demonstrated clinically effective through CRTs but they are still used in treatment protocols. A meta analysis of the literature suggests that as much as 70 percent of all healing in western medicine is a placebo effect. The second problem, who will fund CAM research without profit motive? The government can’t do it all. Our concept of science and how it is applied needs to be reconsidered and expanded to design research protocols that can give meaningful results. Desired outcomes need to be redefined more in line with the World Health Organization’s definition of health - a complete state of physical, mental, and social well being, not merely an absence of disease or infirmity. This is not necessarily a quantifiable observation to which statistical analysis can be applied to give significant probabilities, but rather a way of knowing. Art may provide direction in developing meaning ways of observation. Pharmacological research aims to understand the mechanisms of a drug’s action, determining the direct chemical and resulting physiological effects of drugs on cell and body function. Research into the less quantifiable healing effects of complementary and alternative treatments requires us to expand the process of scientific observation and data collection. Art, particularly the art of photography and video, can be of assistance. Since its invention, photography has served science as a recorder of fact and a historic document. However, we cannot ignore the complicated subtext of visual imagery: the beauty of a photograph cannot be denied, its semantics cannot be ignored. Although a photograph represents fact, it also conveys a truth that transcends fact. Such truths are culturally derived, and they imply wisdom, discovery, human emotions, and shared values. I’m interested in how photography can be employed in scientific observation and aesthetics to increase our understanding of a healing process. Huevos (eggs) was designed with this purpose in mind. The egg healing ritual is prevalent throughout South America. An egg is passed over the body of the patient from head to foot, and then broken into a glass of water. After 30 seconds, its trailings are read for diagnosis and treatment. For this photograph, a friend and I brought three eggs to a healer’s house in Lima. Following her traditional ritual, the healer was asked to pass an egg over a patient’s body. At the same time, my friend, who is not a healer, passed an egg over me, while a third egg remained in the container. Prior to this, three glasses with water were set up before a large-format camera. Once the eggs were passed, each was quickly broken into the glasses and, 30 seconds later, photographed. I intend to return to Lima to ask the healer if she can identify her egg from the photographs. I will also ask other healers if they can identify how each egg was handled. The healer we used may or may not be able to identify her egg through objective observation. If she cannot, it might indicate that the egg-healing ritual is situational, intended and readable for a particular patient at a particular time. Other answers may lead to different conclusions. This we could say is the objective part of the experiment. However, as we gaze at the image, the transformative beauty and mystery of what we see cannot be denied. The yolk, a single cell - the basic unit of life with its placenta of white, is transformed into a solar unit, the source of life and energy of the universe, surrounded by gaseous interstellar nebulae. This is what I had seen when witnessing a huevo healing in a small town on the Ucayali river. The healer was working with a boy in a shed. After he had cracked the egg into the glass of water he held it up to read. A shaft of sun light through a hole in the shed caught it and I looked in amazement – The yoke seemed to pulsate like the sun and the white tendrils as the solar wind or interstellar gases. It inspired this photographic experiment. I’m a modest practitioner of yoga. I had begun installing the first exhibition of this project when I attended a class that I soon discovered was an advanced class. Gamely I tried to kept up with the asanas, the yoga poses. In final relaxation or savasana at the end of the session I found myself drifting higher and higher, far beyond any experience I ever had during savasana. It was closer to the dream-like expansive effects of ayahusaca, the spiritual and hallucinogenic medicine of the healing ceremonies in the rain forests of South America. Dreamlike imagery passed before and I felt a connection with everyone in the class – sure that we all were experiencing these transcendent state as a single entity. As I drifted through this world I wondered if this powerful transcendent experience of yoga could be could be made richer in the ritual healing environment I was trying to create in galleries. I had felt the healers I had worked with did such with their patients and together we made photographs that we felt would convey the experience of this environment. Through printing, framing lighting and the design and installation of the exhibition I hoped to recreate being there. Could I measure this attempt through a properly design yoga sesseion/experiement in the exhibition gallery. The class will be asked to come a half hour early to briefly see the show then answer a short questionnaire on each person’s experience with yoga and personal concept of healing practices. Several minutes following savasana at the end of class they were asked to describe and evaluate the class and their personal experience during the class and in savasana. They were then followed up with a request for response two weeks later. I would not participate in the yoga but, as in the jungle, would observe to feel what was going on.. I woke up to a thrill of anticipation the day of the experiment. I felt a wave of excitement wash over me when I walked into the ritual gallery, which was amplified with each participant came into the space and experienced the show for the first time and realized that they were going to be part of this very novel first experiment. Nervous anticipation followed. The students laid out there mats and sat on them while Ben the instructor did likewise in front of them. In his perfectly appropriate quiet demeanor he introduced the class and it’s purpose. I felt myself getting lighter not unlike the magic savasana several weeks before. My emotions inside exploded and I burst into tears. All this time in the jungle, on the roads, in the mountains not knowing really if this project would come together, that I would find a way to show it, to birth it into its own being of experience for others rather than my experience. I had no concept of what it would be or what it would feel like. And now this, a yoga class in my exhibition at the Minneapolis Institute of Arts. I felt such gratitude for being chosen to be the one to do this and experience it. I had to shake myself out of it, regain my composure – and photograph. Like with the healers in the jungle, I had worked collaboratively with Ben and the participants on this experiment, now photograph it. It was with soft reverent feet I moved around an made my images. Then I participated in savasana with them.. I didn’t get the high of the earlier class; I had already experienced that today. Several minutes following the sessions they filled out the second half of the questionnaires. There was a relaxed mellowness in the air. The students voiced their positive experiences with various levels of enthusiasm. While there are many flaws in this design and we had only six participants, their feedback was strongly positive response to the environment that seemed to grow in depth with time. All were interested in the goals of the experiment and had thought there would be a correlation. It’s the nature of yoga practitioners, either they had it and were drawn to yoga or yoga developed it within them. Expecting positive outcomes by the subjects of a subjectively evaluated experiment will influence the results and is not good experimental design. On the other hand what are we looking for? We have seen that one of the main healing tools of the healer is to get the patient to believe in a positive outcome. Results that lead to enlightened thinking are useful results. Like the Huevos experiment, the yoga experiment is a pilot project for further development and stimulating thinking into new ways of observation and evaluation of healing procedures.